Stem: trunk < 16 m, < 70 cm wide; mature bark red-brown. Leaf: (3)4(5) per bundle, 2--5 cm, curved, blue-green, adaxially +- white; sheath deciduous. Seed Cone: spreading, 4--8 cm, +- spheric, light brown; stalk < 1 cm; scale tip knobs < 15 mm, angled, truncate. Seed: wing persistent on scale. Ecology: Pine forest, pinyon/juniper woodland, chaparral; Elevation: 1100--1800 m. Bioregional Distribution: s PR, SnJt; Distribution Outside California: northern Baja California. Unabridged Note: May be of hybrid origin. Trees with leaves generally 5 per bundle have been described as Pinus juarezensis Lanner, treated as a syn of Pinus quadrifolia in FNANM. 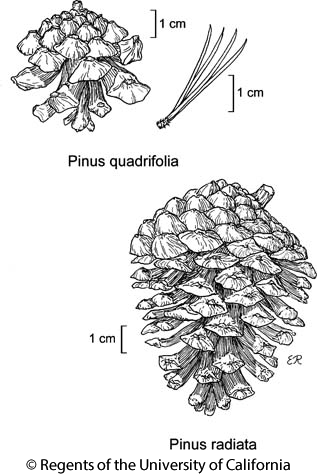 Citation for this treatment: J. Robert Haller & Nancy J. Vivrette 2012, Pinus quadrifolia, in Jepson Flora Project (eds.) Jepson eFlora, http://ucjeps.berkeley.edu/eflora/eflora_display.php?tid=38298, accessed on April 23, 2019.
s PR, SnJt; Markers link to CCH specimen records. Yellow markers indicate records that may provide evidence for eFlora range revision or may have georeferencing or identification issues. Purple markers indicate specimens collected from a garden, greenhouse, or other non-wild location.